Ask Dannie Durand if she's a biologist or a computer scientist and she'll pause, smile and say bothand neither. "I'm a computational molecular biologistpart of a growing and active community of researchers who have expertise in both fields," Durand says. "More specifically, we're familiar with a growing body of new methods useful in areas such as understanding the human genome." Now that large quantities of gene and protein sequence data are available, Durand says computational analysis is crucial to solving three critical biological problems: how genes interact to produce living cells, how gene malfunction causes disease and how complex, multi-cell organisms evolved from simple organisms. Durand earned a rare honor this past fall when she was selected to receive the highly competitive $625,000 David and Lucile Packard Fellowship in Science and Engineering. The Packard fellowship and a $1 million National Institutes of Health grant will launch Durand's computational research program to study the role of gene duplication in vertebrate genome evolution using the mouse as a model organism. "Modern vertebrates all have more or less the same set of 30,000 genes," Durand explained. "Invertebrates, like the fruit fly, have only about 15,000 genes, while single cell organisms, like yeast, have about 6,000. Where do these new genes come from? Which genes are found in all organisms and which are specialized to a particular family of organisms? These questions fascinate me." Gene duplication, which results in extra copies of existing genes, is one mechanism that generates new genes. These extra copies then mutate to acquire new roles in the cell. "If we can understand how these genes acquired new function following duplication, we will have a better understanding of how we evolved and the roles genes play in vertebrates living today," Durand said. The implications of her work and work like this may be profoundparticularly in advancing scientific understanding of how human disease occurs and what treatments can be made available. "Take the classic example of hemoglobin, a family of duplicated genes. A mutation in the adult hemoglobin gene causes sickle cell disease, which is characterized by anemia, joint pain, organ damage and in severe cases, death," Durand said. "If we could determine how to turn on the foetal hemoglobin gene in adults afflicted with this disease, it would partially compensate for the faulty adult hemoglobin and these symptoms could be ameliorated." Answering these questions poses an impressive challenge because of the sheer volume of genomic data to be analyzed. 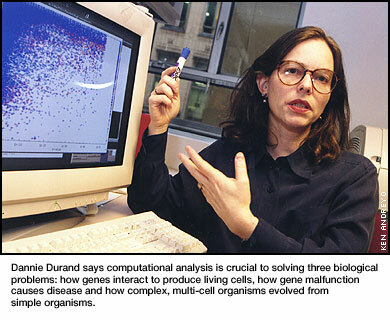 Since 1997, Durand has focused on new ways to use computation to study thousands of genes simultaneously. Durand says studying genes in this volume reveals patterns and trends not obvious when scientists study a few genes at a time. To do such high volume work, Durand uses WWW "bots," or programs that download information from distant and distinct biological databases and combine that information in novel ways. When Durand first started sending her bots out to retrieve biological information, very few researchers used this approach. It was so unusual that she received a concerned email from the National Library of Medicine (NLM), asking why their database had received 27,000 requests from her site in a three-day period. Today, the NLM database provides a standard interface for retrieval bots. "This is one of many examples of why sophisticated computation is so important in modern molecular biology," Durand adds. Durand's computer science expertise has its roots at Columbia University, where she earned her Ph.D. in that field. After completing her doctorate, she joined the scientific staff in Bellcore's Computer Science Research Department. Her interest in evolutionary genomics arose through a series of workshops in computational molecular biology hosted by DIMACS, a theoretical computer science institute at Rutgers University. There she met Lee Silver, a professor of molecular biology and public affairs at Princeton University. Silver is the author of "Remaking Eden: How Cloning and Genetic Engineering Will Transform the American Family." Their conversations about evolution and genetics piqued Durand's interest and eventually led to collaboration. Durand became so engrossed in her research with Silver that she left Bellcore to pursue biology full time. She spent two years at the University of Pennsylvania working with the distinguished population geneticist, Warren Ewens. In 1998, she won a Sloan-DOE fellowship in computational molecular biology that enabled her to spend two years in Princeton's Molecular Biology Department. Durand joined Carnegie Mellon's small but strong community of computational biologists as an associate professor of biological sciences and computer science in September 2000. Next fall, she will introduce a new course on computational molecular biology and genomics aimed at seniors and firstyear graduate students that will follow Professor Robert Murphy's introductory computational biology course. "Carnegie Mellon is a wonderful place for me because unusual approaches are appreciated here and it is easy to collaborate with students and faculty in different fields," Durand said.